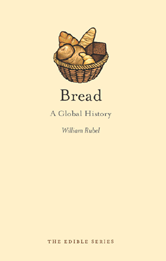 William Rubel takes us on a journey to discover breads around the world, from Mexican pan dulce to French baguettes and German pumpernickel, and shows how the kind of bread you eat reveals who you are. He also describes the techniques of bread-making, from ancient recipes leavened with brewers yeast to the factory-made sandwich loaf. Containing a glossary of over one hundred different breads from around the world, Bread will be an inspiration for all bakers, as well as anyone who enjoys a simple slice.